An axe is ideal for chopping wood while a maul is suitable for splitting. However, improvements in the axe head have to lead to the creation of splitting axes. This means a splitting axe is specifically designed for splitting wood just like splitting maul. The confusion now is whether we should split wood using a splitting axe or maul. How Does A Splitting Axe Differ From A Splitting Maul? 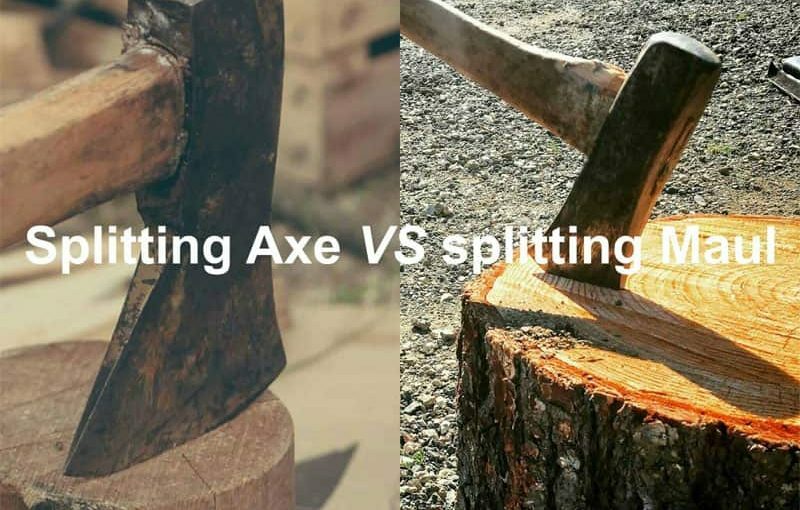 Splitting Axe Vs Maul – What Is The Conclusion? A splitting axe is a tool with a tapered head made of metal and generally weighing about 3 to 6 pounds. It is designed to split wood along its grains in order to break the fibers apart unlike the traditional axes that cut wood along across its grains. When you swing the splitting axe down, the force produced by its head causes the wood hit to split. This tool has a handle made either of wood or composite material. Generally, a wooden handle is more comfortable and aesthetically appealing but may be break easily due to impact, heavy use or wrong use. A composite material such as fiberglass may not look great but is very durable. The handle may also influence the overall weight of the splitting axe. A splitting maul is a wood splitting tool with a metal head weighing approximately 6 to 8 pounds (2.7 kgs to 3.6 kgs). Mauls have a wedge shaped head although certain modern models feature conical heads or swiveling sub-wedges. The head is wider than that of a splitting axe and this makes it better at splitting wood than traditional axes. The wide head ensures that maul does not stick in the wood when splitting wood, a major problem with traditional axes. The wedge section of a maul’s head must show slight convexity to prevent jamming. The handle of this tool differs slightly from that of the splitting axe in design and functionality. Maul’s handle is closer to the round and straighter than that of an axe. The design makes the handle great for levering and swinging. The handles can be made from hickory, fiberglass, and plastic. Plastic handles are very durable meaning they are more difficult to break than handles made from wood or other material. As you might have learned from the above definitions, a splitting maul weights between 6 and 8 pounds while a splitting axe weighs between 3 and 6 pounds. This difference is weight is a double-edged sword so to say. Since splitting axes are multi-purpose and lighter allowing you to use it for longer without developing fatigue quickly but it reduces the efficiency of the tool. Splitting mauls are a little bit heavier but this gives them more efficiency in wood splitting. Perhaps the biggest difference is in the head design of these two tools. Splitting axes feature tapered heads with sharper blades. For this reason, it can cut wood as well as split wood and this is what makes these tools versatile and multipurpose. Mauls, on the other hand, have fatter and blunter heads with wider wedge making it extremely efficient in splitting wood along its great grains. For this reason, splitting mauls require pure effort to work. If you use the right technique, you can find splitting firewood with a maul extremely easy. This explains the reason why you will find it extremely difficult to chop wood with a maul but it is possible with a splitting axe. Another clear difference between a splitting axe ﻿vs ﻿maul is the handle. A maul usually features a longer handle to guide the tool into the ground after it as finishes splitting the wood and not back in the direction of your feet. This is an important safety feature that prevents eliminate the risks of injuries due to unintended accidents. 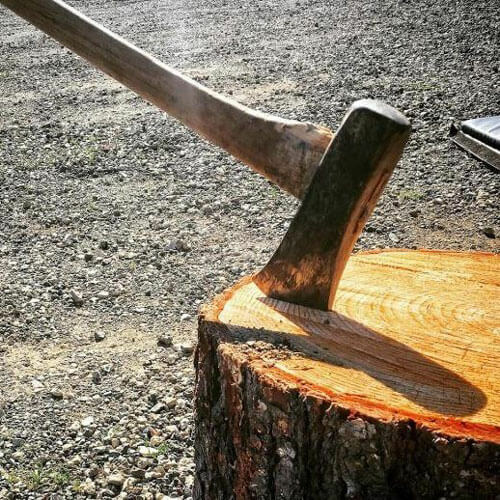 Most splitting axes feature shorter handles in order to allow it to achieve wood splitting and wood chopping. The shorter handle allows you to lean over to limb a tree lying on the ground so that the splitting axe swings above the ground. To tell the difference between the two tools based on the handle, use your arm length as an approximate guide. If the handle of the tool is longer than your arm then it is a maul, and if the handle is shorter or equal length then it is splitting axe. In most cases, splitting axe handles are made of wood but recently more brands are choosing to use composite materials. Splitting mauls, on the other hand, most commonly feature other materials such as plastic, fiberglass or hickory but wooden handles are also used. There are no clear-cut differences between splitting axe and maul when it comes to price. However, if you compare a maul costing 50 dollars with a splitting axe costing the same amount, the splitting maul will be of a lesser quality. In other words, a splitting maul is just slightly costlier than a similar quality splitting axe. If you ask me, the choice is ultimately personal. The size of the wood piece you intend to split and the amount of work you have at hand should be the greatest determinants. 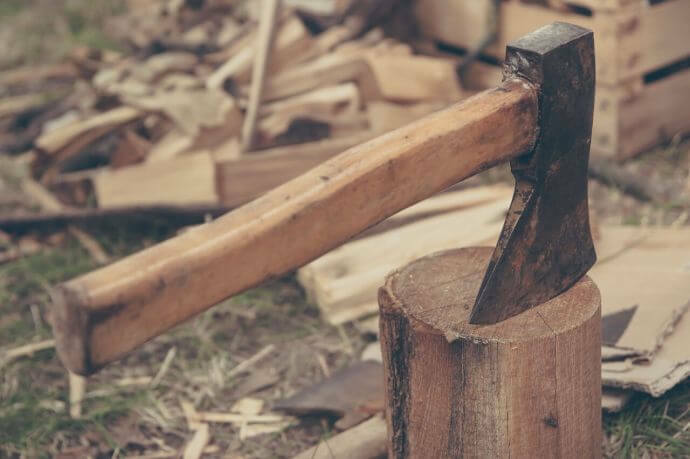 In dealing with large chunks of wood, a maul will be a better alternative than an axe. You will split quicker but you will be exhausted much faster given the weight and size of a splitting maul. If you have to deal with smaller pieces of wood or just splitting around the chunk edges than a splitting axe would be a better alternative. This choice is also great for shorter and smaller users because they are easier to swing, lighter to carry and may achieve the same results a splitting maul can deliver in similar sized wood chunks. I’m so clear that which is the best between splitting axe and splitting maul. I was in confusion until reading this article.